FokiaNou Art Space is pleased to present PHASMA, a group exhibition of paintings on canvas and paper. The word phasma in ancient Greek means the seeming presence, the ghost, the vision, the reflective presence of someone, the simulacrum, the omen, or something monstrous. It derives from the verb phaino that means to radiate, to throw light, to emerge for the first time, to be born, but also to become along the way through behavior. In modern Greek it also specifies a class, a field structured (based on a common feature) in a whole, whose elements are characterized by variety and diversity, while it also constitutes a term in physics that indicates the wide and continuous frequency range in which the waves have a common feature (solar, acoustic, electric spectrum). 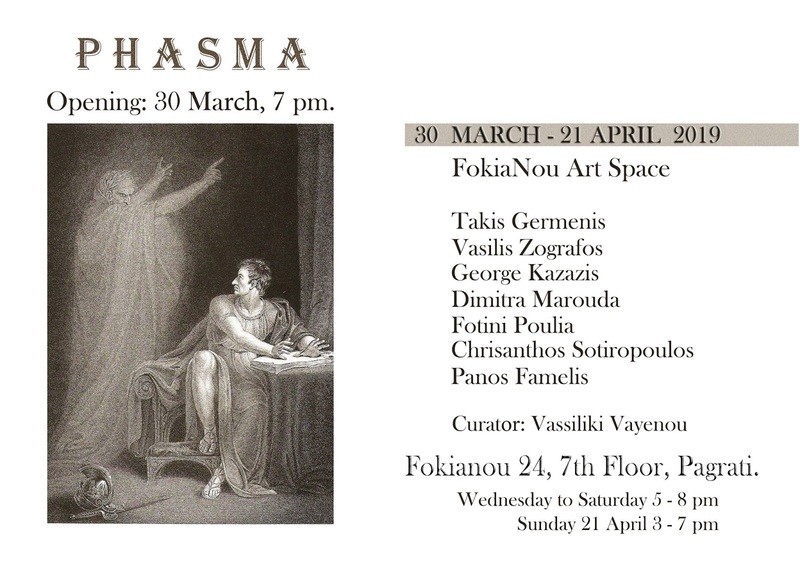 The exhibition entitled Phasma explores what is perceived by the senses but does not have a substantial, solid, compact existence, such as a vision, an unexpected appearance, the nature of which is undefined, vague, fleeting. It investigates the ways in which a fabrication or a figment of the imagination, a misleading illusion of the mind becomes manifested in the senses aiming at cheating both. It deals with the depiction of the intangible, the spectral, the deceitful as concepts or the adoption of stylistic and aesthetic elements of the composition that create or intensify a visionary, intuitive impression when viewing the artwork. Workshop for elementary school children: Saturday 13th April, 5:30pm with Panos Famelis at his studio in Kypseli. Materials fee: 5 euros. For reservations and further info please send a mail to: vavayenou@hotmail.com.